SPX: After a very good last week, this week wasn't that good. Already on Monday the market opened above the important resistance level around 1075 suggesting that we might see a new high in the coming days. 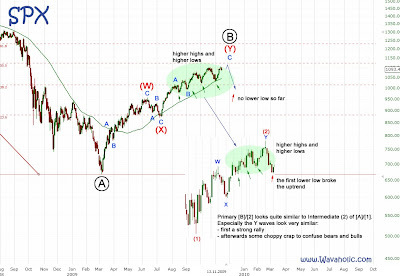 Two days later the SPX hit 1105.37 making a new high in 2009 and invalidating the bearish count I posted last weekend. Concentrating on the long term picture I spotted a nice fractal: Intermediate (2) of Primary [A]/ looks very similar to the current rally since March. It doesn't match perfectly but especially the last four months are very similar. To sum up, I'm waiting now for a lower low, i. e. an SPX below 1030 to go short. That would confirm the Ending Diagonal Scenario and also match the Intermediate wave (2) fractal.